A science-fiction film that is packed with horror in every reel, "The Lost Missile," opened in 1958, a United Artists release. It is all the more horrifying because, although termed "science-fiction," it is altogether too much within the realm of the possible for comfort. The story deals with a renegade radioactive missile, lost in space, whirling around the earth at 5,000 miles an hour, destroying everything in a swath ten miles wide leaving only desolation and death in an endless circle of global destruction. The picture stars Robert Loggia, Larry Kerr, Ellen Parker, Philip Pine and Marilee Earle, with Fred Engleberg, Kitty Kelly, Selmer Jackson and guest stars, Joe Hyams and Bill Bradley. The late John McPartland wrote the screenplay based on a story by Lester William Berke who also directed the picture. Lee Gordon produced the William Berke, Inc. production. For more than three months camera and technical crews filmed surging, terror-stricken crowds in Ottawa and Montreal, Canada; Paris, London and New York, with Director Berke supervising the vast undertaking. In addition to the massive and detailed coverage virtually from the four corners of the earth, Berke, with the cooperation of defense officials, made tens of thousands of feet of film at the nation's various missile installations. Producer-director Berke also screened more than 1,000,000 feet of official government films of America's efforts and accomplishments in the field of intercontinental missiles. Traveling at 5,000 miles an hour, a renegade radioactive missile, lost in space, is whirling around the world, destroying everything in a swath ten miles wide, leaving only desolation and death. 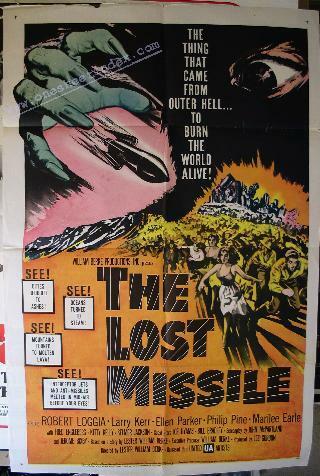 Again and again, the Lost Missile rips its way around the earth, pouring the fury of radioactive fire on the land. Given time, it will scorch all life off the face of the globe. Untold millions of terror-crazed people stampede in panic. New York City has liffie more than an hour to live. Radar eyes and experts locate the rocket of flaming death, plot its course - and die when that course comes near.